AJ Houston ’03 works in Global Equity Trading for the Royal Bank of Canada Capital Markets. In his role, he services the liquidity/trading needs of US-based mutual fund and hedge fund clients for Canadian Equity product. Prior to joining RBC CM, he served as an investment analyst for the J.P. Morgan Endowments & Foundations Group within the J.P. Morgan Private Bank, where he helped not-for-profits and charitable organizations achieve their investment objectives. 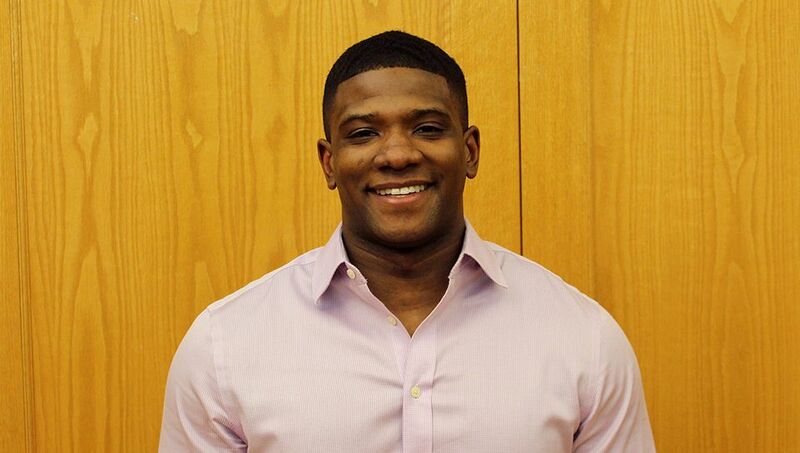 Before entering the workforce, AJ attended the Taft School and then Dartmouth College, where he played football and majored in Classical Studies with a focus on Latin. AJ has been a member of the St. Bernard’s Board of Trustees since 2012 and also serves on the St. Bernard’s Old Boys Diversity Council. What are your favorite memories at St. Bernard’s? Wow – where to start? Mrs. Rhodie’s “Santa Lucia” assembly in first grade, yearly basketball tournaments at Buckley, Friday afternoon birthday parties in the St. B’s gyms, our fourth grade homeroom project on an animal of our choice (mine was the lion in Ms. Gillespie’s class! ), writing personal notes in Mr. D’s fifth grade class to our future selves… just to name a few. One of my fondest memories, however, was graduation day and watching a tribute video comprised of short clips of every boy, highlighting memories from our St. B’s childhood. It was quite the tear-jerker, but made us all realize just how special a place St. B’s is, the bonds we had made, and how much we were going to miss it. Latin classes in general were a favorite of mine and ultimately what inspired me to major in it. However, I think it was Mr. Demeny’s mental aerobics class that stood out for me the most. To this day, I still remember fun facts from that class such as the names of the lions outside of the 42nd Street New York Public Library (Patience and Fortitude) or Frederick Olmsted and Calvert Vaux being the co-designers of Central Park. I also credit that class for helping me memorize the avenues of New York City in order from the East River to the Hudson. Did you have any favorite teacher(s)? A tough one because there were so many good ones, but I think Ms. Kronengold will always be special to me. Her love for the school and students alike was unforgettable (and I know my mom would echo the same sentiment). Soak up as much possible knowledge as you can in the classroom, but really take time to enjoy the friendships and relationships that you are building now. You don’t realize it, but some of your current classmates will be your best friends for the rest of your life.